Begg Practice will be closed for the Easter Bank Holiday. Please call NHS 111 (or visit 111.nhs.uk ) for all medical advice or 999 for emergencies. If you need to see a GP please attend the Clapham Junction Walk-in Centre. Begg Practice wishes all patients a very happy Easter. We have launched our new mobile friendly website. We hope you find it both useful and informative. If you have any comments or suggestions about this website, or how it can be improved, please let us know by submitting our contact us form. Begg Practice has launched DoctorLink. DoctorLink is a web based platform that provides digital triage services to patients 24 / 7. The DoctorLink app will give initial suggestions for management, assess and send an email to the practice reception team stating how urgently the consultation should occur (with your clinical information kept for the doctor to review). The reception team / doctor on call will ring you back with advice or an appointment. Please note the app will give contact details of local services if appropriate. The Practice is trialling Saturday morning clinics from Saturday 17 November 2018. There will be prebooked routine GP appointments and Nurse appointments for Cytology/ Cervical screening Services Only. GP appointments are also available for online booking if you have access to Online Patient Services. Saturday opening hours are 8 am till 12 pm. 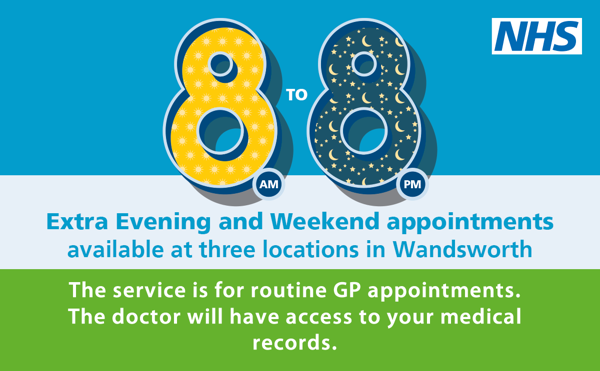 You can now be seen by a GP outside of the practice opening hours at one of the 8 to 8 GP hubs in 3 of the Wandsworth localities. The consulting GP will have access to your full medical history and will document the consultation directly into your notes. These appointments are available up to 8pm on Saturdays and Sundaysand are for routine medical issues. You can only be booked into the hub by staff at the practice who will decide if it is appropriate for you to be given a hub appointment. Please be aware these appointments are limited and are for other local practices to use also. If in the event there are no appointments at a hub you will be advised to wait for the next available appointment at the Practice. Vaccine deliveries are taking place from September 2018 – November 2018. We are holding a number of flu clinics during these months. Please inquire at reception. If you have received your Flu Vaccine elsewhere please inform the practice so we can mark it in your medical record. Please ensure we have your uptodate contact details so you will receive text alerts for flu clinics.